Pin it! 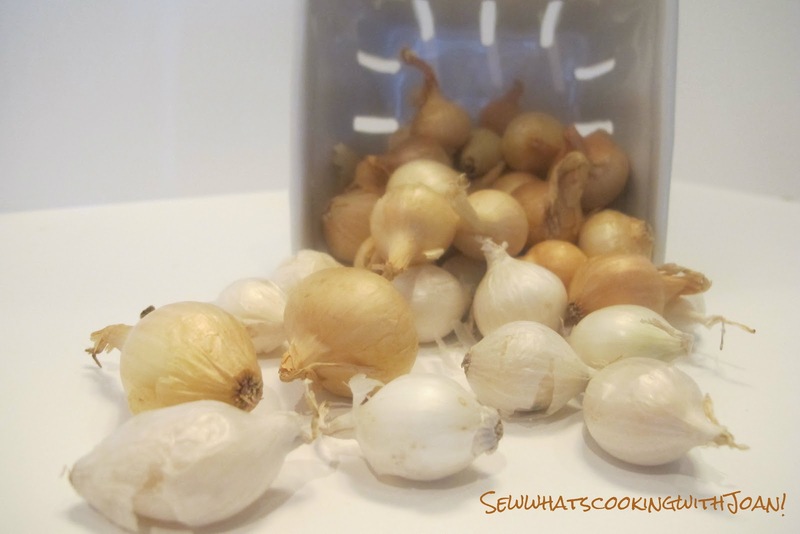 Onions are one of my favorite foods and these roasted onions are so tasty and easy to make. While I was looking for side dishes for my steak tenderloin, I remembered making these for a side last Spring with ham. I wrote the recipe, took the picture, but, did not deliver to you! 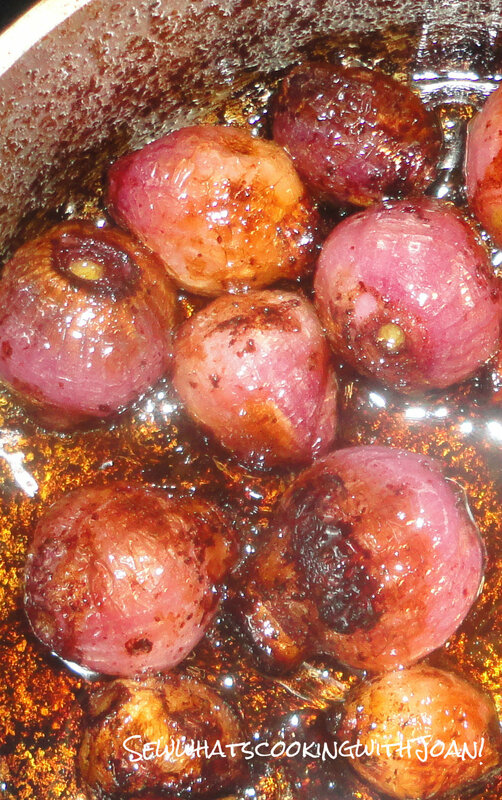 I really enjoy roasting vegetables of all sorts and I was looking forward to roasting onions. This recipe is pretty straight forward, no muss and no fuss. Roasting the onions brings out their natural sweetness and are a perfect side for steak, ham or any of your Fall dishes. I am pleased to offer another really tasty way to enjoy onions! 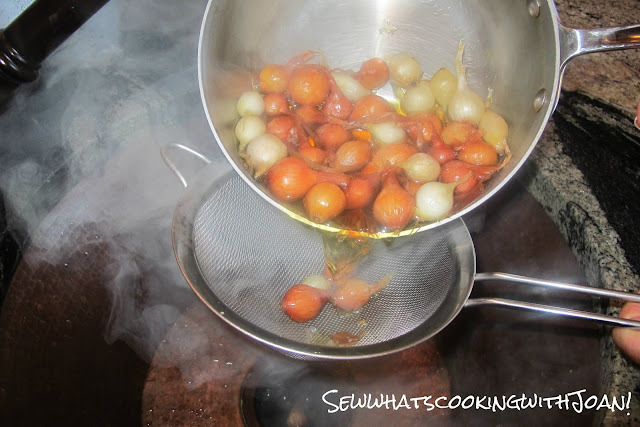 Roasted pearl onions are rich in flavor and nutrients. Put a 1 1/2 or 2 quart sauce pan 3/4's full of water on the range burner set on high to boil. Prepare a large bowl of ice water and set a colander in the sink. 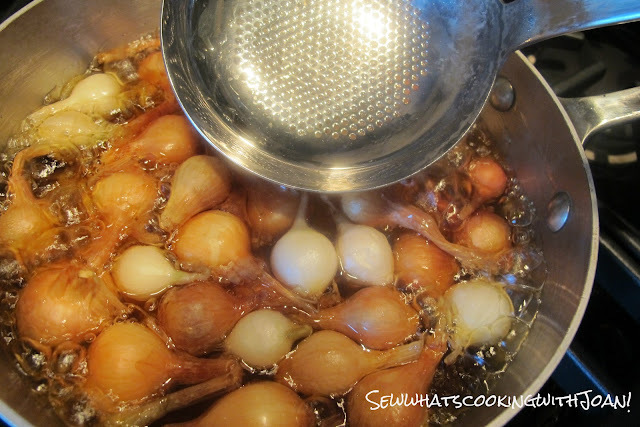 Plunge the little pearls into the boiling water for about 1 minute! Scoop them out and into the ice water to stop the cooking. After a minute or two pour into the colander. pearl onion up by the stem ... squeeze the stem of a onion with your thumb and fore finger in a way to pull the onion stem and peel up and push the onion down ... so that a peeled onion will just pop out into your bowl. Most of the onions will pop out of the skin very fast. Once you get the hang of it, you'll marvel at how easy it is to peel a pearl onion. When your baking dish is full of pearls pretty red, yellow, and/or white pearls ... drizzle olive oil over them ... so as to lightly coat all of the onions with olive oil ... salt the onions ... and put the baking dish in your 350 degree oven ... 40 to 50 minutes will likely be enough to bake the onions tender. 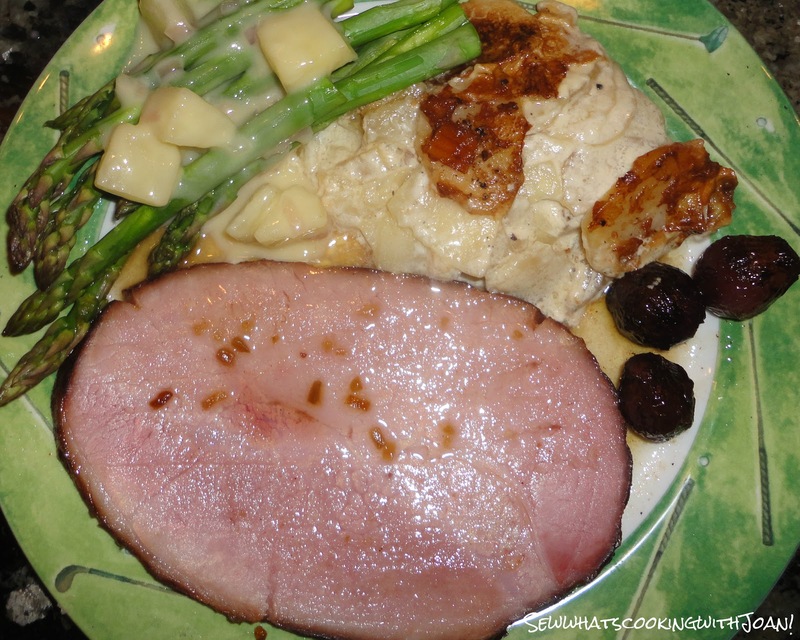 Serve with your dinner entree and enjoy the fabulous full flavors of pearl onions. The picture displays a few red and yellow pearl onions 'cause that's all I had the day I made the dish for supper and for the blog. I believe Trader Joe's sometimes sells a mixed bag of all three. If so, I'd buy and prepare two bags because I love to eat roasted pearls! You can't beat this delicious dish! We had an active weekend! Thursday night my son-in-law Nate Dogg's sister married her high school sweet heart. They chose Thursday, so they could be married on 10-11-12. It was really fun and beautiful! Friday morning we woke up and drove to Eugene, Oregon, for our granddaughter's first birthday! Laura, had a over the top beautiful party for 44 guests!! Julia, our grand daughter was adorable and enjoyed every minute!! 4 hours later, she was still wanting to party, but, Mom wanted to go wine tasting with the girls, while the guys watched the football game. Ross, her Dad, our son-in-law babysat and off we all went to a beautiful winery, King Estate, in Veneta, Oregon. If you are ever in the area, I recommend! 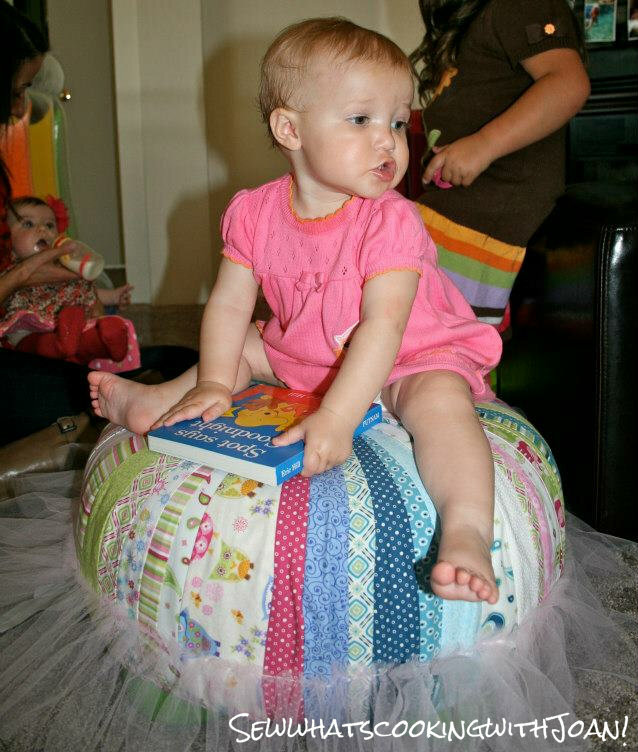 Julia is sitting on the tuffet I made for her! I think she likes it, I know her Mom likes it! And Wee Bear went to the bookstore to pick out three little story books for her. I will do a blog on the tuffet. I have made several. Sewist's watch for it in the future! From Julia's Birthday, we raced home Sunday morning and I made it to my nieces baby shower in Black Diamond, Washington! Another beautiful event! Allie is having a baby boy, Ryder! We are really excited! Tonight, we are going on the ferris wheel with Sweet One, her sister Emily, her husband Lewis and TT. We are also going to the Chihuly exhibit at the Seattle Center! Then, we are all out to dinner with Nate Dogg and Tink! I can't wait! The tuffet couldn't be more perfect. It looks beautiful in her room. Such a nice surprise! Thank you!